There were a lot of variables in place as the IZOD INDYCAR Series prepped for the 2011 Edmonton Indy. Due to an off-season decision by the Edmonton City Centre Airport favouring air traffic over an auto race, the annual race almost faced complete cancellation for 2011. Thanks to an efforts of many including promoters Octane Motorsports Event to preserve the race, the Edmonton Indy was relocated to another section of the airport on to a 13-turn, 2.224-mile road course. While the new circuit presented a large unknown, the previous IZOD INDYCAR event in Toronto sent up a lot of sparks within the open wheel series between a multitude of drivers. One of the most talked about moves was the championship-affecting incident when Dario Franchitti and Will Power made contact. While Franchitti went on to the Honda Indy victory, Will Power was later collected in a fight with Alex Tagliani leaving the Australian Penske Racing driver very frustrated. Not the only driver leaving Toronto disgruntled, it remained to be seen if the same attitudes will come into play for the second Canadian IZOD INDYCAR round. With some suggesting INDYCAR officials were somewhat too permissive of avoidable contact incidents, some were also expecting the drivers could be under more scrutiny. The first and only truly nice day for the Edmonton Indy weekend, Friday concluded with no track activity due to heavy precipitation. Subtracting some much needed some much needed track time for the IZOD INDYCAR drivers and team, the race pace on the new surface wasn't determined until Saturday. 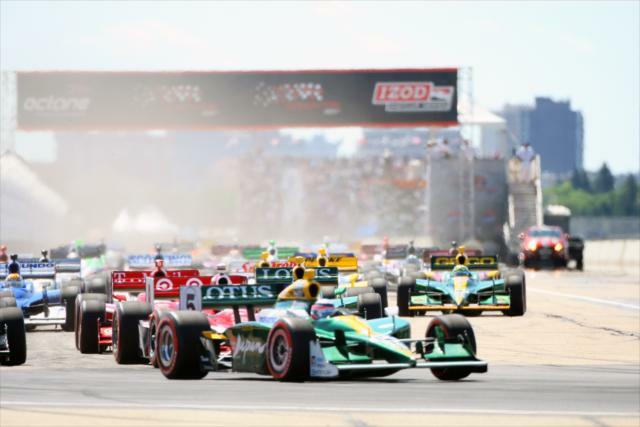 Originally scheduling the Edmonton Indy race for 90 laps, the INDYCAR sanctioning body would be forced to shorten the event to 80 laps as they attempt to accommodate the race within the typical 2-hour window. Taking a stunning pole position on Saturday, KV Racing Technology #5 car driven by Takuma Sato led the field to green for the 80-lap 2011 Edmonton Indy. The 26-car IZOD INDYCAR field sailed through the Edmonton Indy's infamous first turns until mayhem ensued in turn 7. Attempting to gain ground early from a 17th place starting spot, the #77 Sam Schmidt Motorsports car of Alex Tagliani aggressively dived into left turn. A less than advisable move, Tagliani's car slammed the #38 car of Graham Rahal. In a chain reaction collision, the 2011 Edmonton Indy was ended for veteran Canadian racer Paul Tracy. Driving the #8 Dragon Racing car, Tracy was clipped by Rahal resulting in race-ending damage for both drivers before they recorded a single lap. The #34 car of Sebastian Saavedra was also involved in the lap 1 mess but was able to continue the race once a 3-lap caution period concluded. Causing the accident which resulted with Tracy and Rahal getting relegated to last place finishes, Alex Tagliani's #77 car needed only a new front wing assembly to resume racing. However, INDYCAR officials would not allow the French-Canadian driver to go without penalty. On lap 6, Tagliani submitted to a drive-through penalty as he would continue to what would amount as a 17th place finish.Tagliani became the first of three cars to be reprimanded with the "Avoidable Contact" call through the Edmonton Indy race. Despite all the carnage in the 2011 Honda Indy Toronto, there was only a single penalty issued. Starting first, Takuma Sato made the most of his 2nd IZOD INDYCAR Series pole leading for 18 laps over the Penske Racing car of Will Power. 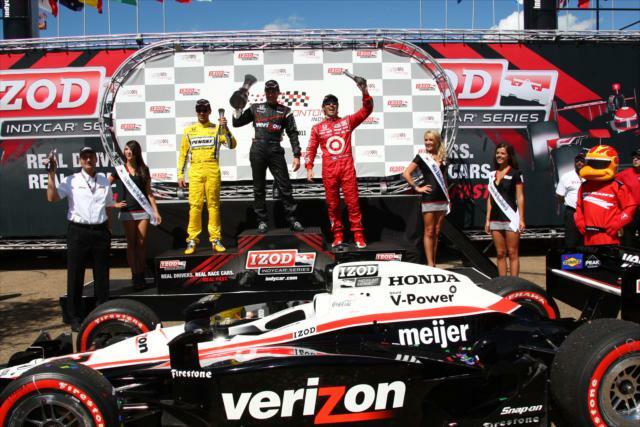 As the IZOD INDYCAR overall drivers standings shifted from a tie to a sizable gap in only two races, Power needed to rely on his previous fortunes of the Edmonton Indy race. The winner of the 2009 race at the airport circuit, Will Power demonstrated on lap 19 an appreciation for the new course by taking the lead from Sato. Though Alex Tagliani's penalty for contact on track, there would still be some overly aggressive attempts of overtaking by the mid stage of Edmonton Indy. On lap 27, the #27 Andretti Autosport racer piloted by Mike Conway made a dueling move for position with Newman'Haas Racing's #2 car of Oriol Servia into turn 12. Misjudging the pass, Conway collided with Servia. Drawing the race's second and last full course yellow, Mke Conway collected a drive-through penalty. The second Newman/Haas Racing car would also become a victim of circumstance during the Edmonton Indy's lap 26 caution. The #06 car driven by rookie Canadian driver James Hinchcliffe ended up stalled on track as result of a chain reaction low-speed pile-up. "... everyone was lining up to dive into the pits everybody starting jacking around down at the hairpin, trying to brake-check everyone to get a good run into the pits to create a gap but all it does is create an accordion effect. Unfortunately I didn't see it soon enough and got into the back of Danica." Hinchcliffe said in regards to the incident. With the help of safety crew members, James Hinchcliffe was able to rejoin the race in the #06 Newman/Haas Racing car. However, both Newman/Haas Racing runners would be out of contention for worthy top-10 finishes to accompany their qualifying performances. On the lap 29 restart, 3rd place starter Scott Dixon met the worse end of on-track contact. While Dixon was able to nurse his #9 Target-sponsored car back around the track, the Target Chip Ganassi Racing driver and crew realized damage to the Dallara required extended repairs. Taking 5 laps to repair what was believed to be a fluid leak, Dixon would finish 23rd losing a sizable amount of IZOD INDYCAR points in the overall season standings. "Unfortunately we didn't get a chance to show that speed. It was one of those deals where I could see it happening in my mirror but couldn't get out of the way. We just can't buy a break I guess." Scott Dixon responded after the race. Starting on the pole, the #5 KV Racing Technology car piloted by Takuma Sato maintained race pace with the best of team cars presented from the stables of Penske Racing and Target/Chip Ganassi Racing. Staying in the top-5 after Will Power passed him for the lead on lap 18, Sato's green #5 car was looking fantastic at one-third race distance. Running great past the second restart, Sato's plans to finish the Edmonton Indy strong was defeated when the #28 Andretti Autosport car of Ryan Hunter-Reay spun the Lotus-sponsored #5 KV Racing Technology vehicle on the fifth turn. Though Takuma Sato suffered minimal damage, the #5 Dallara-Honda sat stalled in turn five losing a full lap. In the mid-race clashes, both Mike Conway and Ryan Hunter-Reay would seek out the impacted driver to apologize (a stark contrast to the Honda Indy Toronto where tempers were settled at a much slower pace). With the KV Racing Technology pole sitter as well as Scott Dixon out of contention, the #12 Verizon Penske Racing machine of Will Power demonstrated his road course prowess. By lap 57, Power took affirmative control of the Edmonton Indy lead following Dario Franchitti's pit stop relinquishing the position. In the final laps, the hungry determination of Helio Castroneves pressured teammate Will Power. Finishing with a 0.8 second margin of victory, Power pulled off his second victory in three at the Edmonton Indy race. Leading 57 laps on his way to his 4th win of the 2011 IZOD INDYCAR Series, the Edmonton road course was important in reestablishing Will Power's championship fight. An important podium for Helio Castroneves, the Edmonton Indy race was a revisit to a track the Brazilian theatrically blocked Power and was penalized by INDYCAR. Some believed the aftermath of the Edmonton race has haunted Castroneves' career since. With Penske Racing cars finishing orderly in a 1-2 finish, the 2011 event provided a much more ideal outcome for the superteam as a whole. The Penske most importantly finished ahead of the remaining Target/Chip Ganassi Racing car of Dario Franchitti. From 4th to 6th place were drivers who all started outside of the top-10 at the Edmonton Indy event. The deepest starting KV Racing Technology car, the #82 in the hands of Tony Kanaan rose to his 5th top-10 finish in the 2011 IZOD INDYCAR Series season. In 5th, Dreyer & Reinbold Racing driver Justin Wilson improved 10 positions for a season-best run. Rounding out the last half-dozen runners, Frenchman Sebastien Bourdais collected a second straight 6th place finish. Driving the #19 Dale Coyne Racing car, Bourdais' Canadian race stint has nested his best runs in North American open wheel racing series he was champion in the Champ Car Series. The next race for the IZOD INDYCAR race is set for Mid-Ohio Sports Car Course on August 7th.